If you want to truly experience a time-hungry RPG, you need a plan. I used to be scared of the RPG genre. Growing up, I played plenty of video games like any other kid, but I stuck to stuff I could pick up and put down. Mario, GoldenEye, Doom. I lacked the dedication, the loyalty and the skill to tackle an intimidating dozens-of-hours role-playing adventure. And yet I would ogle screenshots in GamePro or exotic box art like on the SNES game Secret of Evermore or even just mysterious, enticing names like Chrono Trigger. The idea of these cartridges, and the fantastical little universes they contained, had a pull over me: They promised a story-based experience that's unique to the medium of the video game. Sure, I made some stabs at playing the games, but even the high-school-freshman version of me was too busy for the commitment. I had just gotten a car and a part-time job. I played sports, there were girls to date. You know, non-nerd stuff. But oh, how I longed for the nerd stuff. Then a weird thing happened: As I got more established in my career, I suddenly had free time again. I could pick up a hobby. So about five years ago, I decided enough is enough, RPGs: I will beat you. I made a commitment to playing the genre I had longed for. But more importantly than a commitment, I made a spreadsheet. There are a lot of games out there, and the list only gets longer every year. If I was going to tackle this hobby now, I decided I was going to do so with a strategy. Some may call this, not without a sense of frustration and resentment, their "backlog." But I look at mine as a "road map." The first thing I needed to decide was what to play. So I populated my spreadsheet with a hit list, based on two principles. First, I was going to play games that intrigued me on a nostalgic level. And second, I was going to appreciate the genre as a whole: I was going to hit all the so-called masterpieces and sample various subgenres, from JRPGs to point-and-click CRPGs. I filtered my list by games that were both "important" and those that were of nostalgic interest to me. Ultimately, I started off with Chrono Trigger and the original Fallout. To be clear, the only way to work through a backlog is to do it one at a time. Play one game until it's finished, then move on to the next. But I am not blessed with a focused attention span: Playing 10 percent of one game tends to inspire me to start another game, which begets another and so on. To manage this, I keep games color-coded on the spreadsheet: Green means active, yellow means paused somewhere and red means I need to restart. I try not to have any reds, and I work through a yellow every time I finish a green. Sure, this produces weird effects like picking up a "yellow" game for only a few hours a year, but I contextualize these to work on a meta level. There is something odd but also oddly perfect in playing about two hours of Persona 4 every quarter. My crew of high school misfits are perpetually trapped inside my Vita, exactly like how the characters in the game become trapped inside televisions. Some games just work well in disjointed fragments. But in order to get through this list, I need a more detailed strategy than just a play order. I have to deal with the two major problems that are hard-coded into all RPGs. Enemy No. 1 is time. 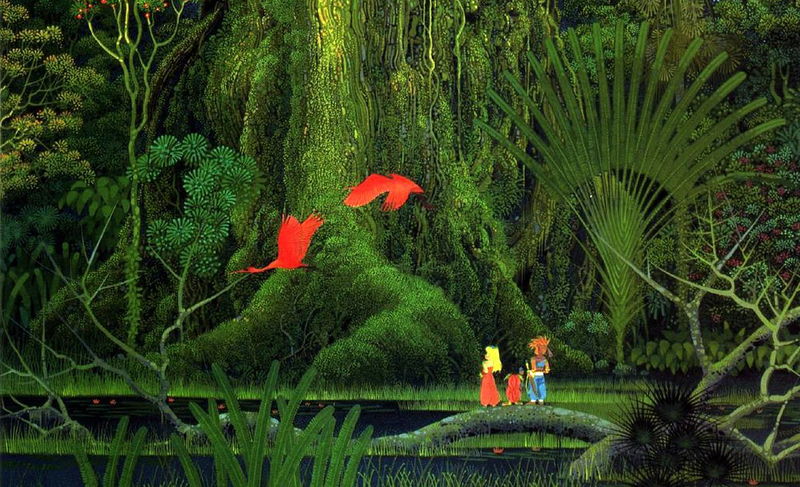 Few RPGs, especially older ones, are respectful of player time, and they demand long commitments. The second obstacle is an offshoot of the first and is exacerbated by short attention spans like mine: the fog of unfamiliarity one experiences upon returning to a game from a long absence. Who are these people again? Why am I climbing this mountain to get a magical MacGuffin? How do I debuff my party? Turning on a detailed RPG after a several-month hiatus is a bit like Capgras syndrome: These people look familiar, but who the hell are they? To mitigate this problem, I plan ahead. 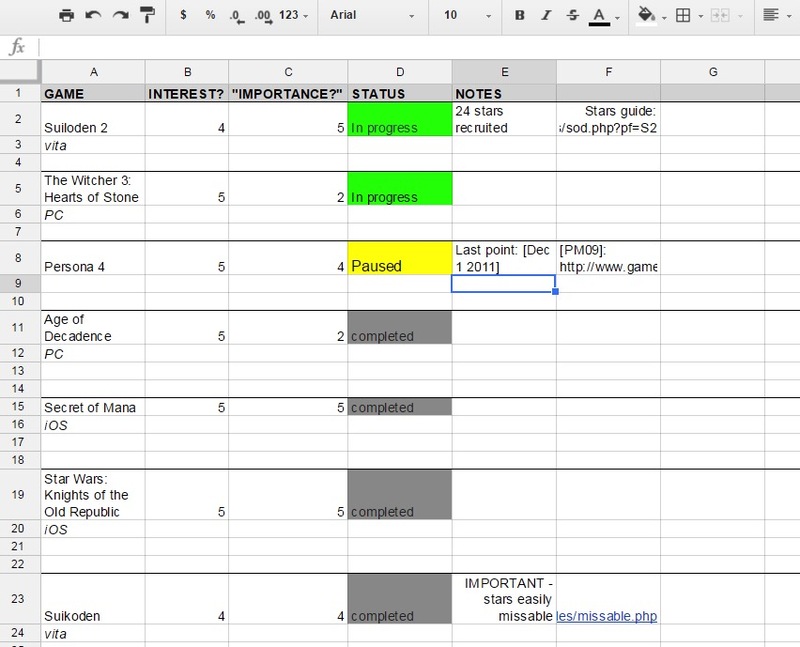 If I know that I'm going to have to hang a game up for a while –- say, a huge work commitment is on the horizon, or I need to get married –- I take down detailed notes in the spreadsheet and add links to relevant primers and walk-throughs. I prepare thoroughly for my own future distractions. There's always Persona 4, waiting in purgatory. But there remains the issue of total time available for gaming. On howlongtobeat.com, a site dedicated to the distressing issue of predicting playtime, the original Xenosaga game averages about 56 hours. Most RPGs fall into this ballpark, and plenty others double or even triple that estimate. But a lot of this time is wasted on design flaws. It's not worth burning your hobby hours banging your head against the wall, trying to suss out unclear objectives or decipher unreadable maps. Instead, I've embraced modern assistance. The moment I'm stuck despite my good faith effort to understand the game, I go to a wikia or a walk-through. Modern tools, such as the save states, are a godsend. EarthBound on Wii U is an amazing story wrapped in an amazing game –- and now your odds of completing it are higher than they have ever been. My strategizing has been paying off. I finally completed the original Fallout experience I started back in 1998, thanks to Good Old Games. It is a rich, crazy, brutal world that is incredibly rewarding to explore and far better than Bethesda's RPG-lite/adventure-shooter Fallout 4. I crossed Chrono Trigger off my list, finally: a victory 20 years in the making (and truth be told, a bit of a letdown!). I even tracked down my holy grail, Panzer Dragoon Saga, after managing to score a cheap Sega Saturn and a good deal on the ultra-expensive game. I played it using the 1998 GameFAQ written by the founder of GameFAQs himself, CJayC (Jeff Veasey). The game was everything I hoped it would be from the blurry, low-res screenshots I saw almost two decades ago in GamePro. The turn-based, directional battle system feels satisfying and modern, and the cutscenes were directed with cinematic flair. "Backlog" does not need to be a dirty word. You don't need to look at it with regret or resentment. Instead, embrace it as a road map to a long adventure of video gaming goodness. Sure, mine continues to grow, but like a boss with 1,000,000++ HP, I will chip away at it and I will prevail. Next up is Suikoden II, supposedly the apogee of the genre. I can't wait to find out if that's true! Her little icon is bouncing expectantly on my Vita. And, of course, there's always Persona 4, waiting in purgatory.